Legian Art Market is a souvenir market located in Legian Street Kuta Bali. 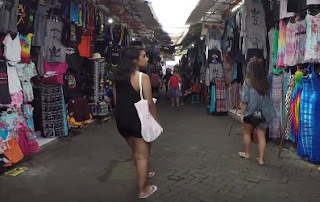 From Legian Kuta Beach you just have to walk about 50 meters and on the east side of the beach you will see rows of clothing stores and Balinese knick-knacks with eye-catching colors along Jalan Melasti. Don't be immediately tempted by an item offered one of the sellers. You should first survey prices before deciding which items you want to buy. Legian Art Market is open from 8am to 7pm, travelers. And goods in this market will usually be cheaper when the market is about to close. Well, you won't be straying right, to look for unique souvenirs or wholesale shopping for Balinese fabrics to be sold to your friends. Not bad the results can be used for the cost of the next trip. Now while recording any items you want to buy in Bali, you should prepare your next trip.